Payment of Gratuity Bill 2018 (Amendment) has been passed by Rajya Sabha for welfare of workers in private sector. Accordingly, all the workers working in private sector who are not covered under CCS (Pension) rules can avail retirement benefits equals to the govt. employees. 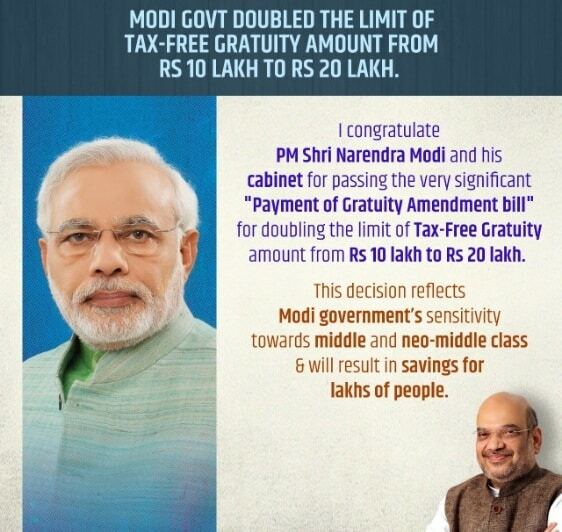 Central government has doubled the tax-free gratuity limit from Rs. 10 lakh to Rs. 20 lakh. This bill will ensure increased gratuity to private sector employees just like Public Sector Undertakings under central government. In this amendment, the Maternity Benefit Leave for women employees which is currently 12 weeks is now extended to 26 weeks. The Payment of Gratuity Act, 1972 is applicable to all the establishments / companies with more than 10 employees. This bill amendment was introduced to provide social security to the workers after their retirement. Minister of State, Labour & Employment (I/C) Santosh Gangwar has moved this bill today which passes through a voice note. All the private sector employees are now entitled to get the same benefits as their counterparts in govt. sector. As per the recommendation of 7th Pay Commission, the ceiling of gratuity is doubled from Rs. 10 lakh to Rs. 20 lakh. This bill provides social security to the entire wage earning population working in various industries / factories. Under the provisions of this bill amendment, all the women workers can now avail 26 weeks maternity leave from currently 12 weeks. All the lady employees will be deemed to be in the continuous service for this time period. Under this Bill, gratuity will get paid to all the employees engaged in either private or public sector including factories, mines, oilfields, plantations and ports. The upper ceiling on gratuity amount under Payment of Gratuity Act 1972 was Rs. 10 lakh. Central govt. now follows the recommendations of the 7th Pay Commission which suggests that the ceiling of gratuity must be raised in consideration with the inflation and wage increase. Lok Sabha passed this bill on 15 March 2018 while Rajya Sabha passes this bill on 23 March 2018.